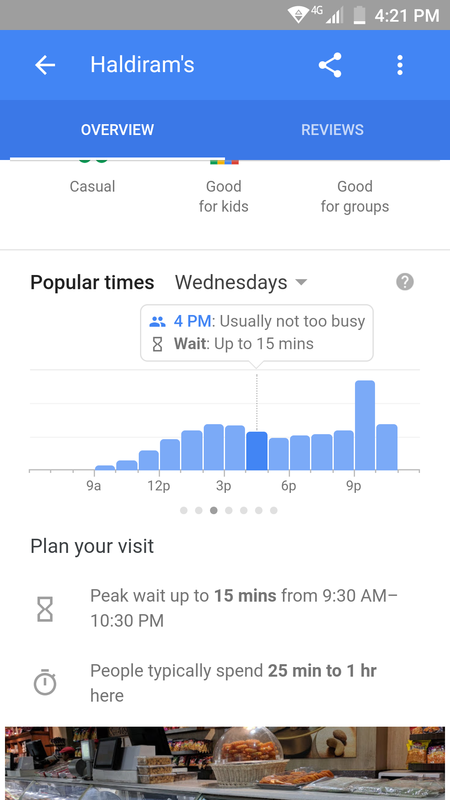 Google has rolled out a new feature to its Google search app and it will now show estimated wait times for restaurants. The feature will also be available on Google Maps after some time. The new feature lets users decide whether to wait for food and also plan ahead their visit to the place at a time when they can avoid the waiting time. So, basically by searching for a restaurant on Google, you could open its business listing, and scroll down to the ‘Popular Times’ section. Here you will see the estimated wait time in real time, and other times of the day as well. You can tap on the bars to see the estimated wait for that time period. Moreover, you can also scroll left and right to see a summary of other days of the week as for how much wait times are there for other days. The time graph will allow users to plan a visit ahead to beat the crowd. The features like Popular Times, Visit Duration, and Wait Time estimates are based on historical data. To estimate popular times, wait times, and visit duration, Google uses anonymized data from its users who have opted into Google Location History. These times are shown on the basis of when it gets visits from users. However, restaurants can’t manually add this information to their businesses. This data will appear when Google has sufficient visit data for the particular restaurant. Similarly, the wait time shows how long a customer would have to wait before receiving their food during different times of the day. This also shows the peak wait time for each day of the week. The displayed wait time is calculated on the basis of patterns of customer visits over the last few weeks. The feature also shows how active the location is right now with Live visit data. It is updated in real time and overlaid on the popular time’s graph in pink color. The visit duration shows how much time customers typically spend at any location. Visit duration is estimated based on patterns of customer visits over the last several weeks.